The London Eye quilt block is a wonderful choice for those learning new patchwork techniques. It is a simple nine patch block featuring the most commonly used patch (after the square), called the half square triangle. But that is not all. 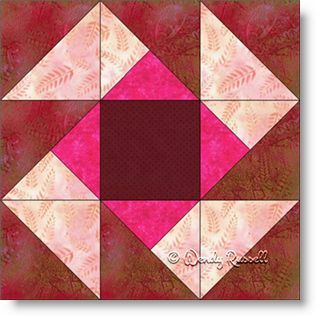 Secondly, you get to use your new skills to construct what quilters call a three quarter square triangle patch, since there are three triangles to fill the square. This type of patch uses a half square triangle piece as well as two quarter square triangles, (so named as frequently, there are four of these pieces to make a patch). The two sample quilts illustrated both use an on point setting, which is a favourite of quilters. This is also a useful method of adding extra, blank squares to the quilt top to make it larger. However, your imagination may come up with many other options. Enjoy!